CWEALF was incorporated on August 17, 1973, making it one of the oldest women’s rights organizations in the country. Over lunches this summer the CWEALF staff has been looking through old photo albums filled with pictures of the founders, early board members and staff, interns and volunteers—all the people that have made CWEALF the vital organization it is today. Along with all the black and white photographs are newspaper articles compiled by a clipping service CWEALF hired to collect news stories mentioning CWEALF and any news related to feminism. It’s been fun and informative to learn about CWEALF’s early work and how times have changed. Here’s a story worth sharing again. Former CWEALF Executive Director, Susan Meredith, wrote the following piece for CWEALF’s 25th Anniversary publication. One day in 1976, I came back to the CWEALF New Haven office after lunch to find a reporter and cameraman from Channel 8 in my office. It turned out that the Supreme Court had just announced a decision regarding women’s employment rights, and the television station wanted my comments for the evening news. The case was Gilbert v. General Electric, in which the Supreme Court decided that discrimination against pregnant people was not discrimination against women forbidden by Title VII of the 1964 Civil Rights Act. Although we had been anticipating a decision in the case, I had not heard the decision before I faced the television camera. It was quite a challenge to make a quick, articulate response to Judge Rehnquist’s conclusion that pregnancy was not related to gender! The Gilbert case was my first introduction to the fax machine. I was going to New York University on the following day to talk to the Women’s Law Association about women’s legal issues. I had to talk about Gilbert but there was no way to get a copy of the decision in time. (Unimaginable in these days of the Internet, but true). Judith Maynes, who was on our board, was counsel to SNET. She said that she could have someone in Washington pick up the decision and send it to her over the telephone. She did, I read it on the train, and the law students and I talked about it. I don’t know whether they were more impressed that I had read the decision or that I had received it on the telephone! CWEALF is proud of the work we have done to help women, girls and their families, and we are indebted to the many staff and board members, volunteers and funders who made this work possible. Read more about our history and impact and view a timeline of CWEALF’s work through the decades here. 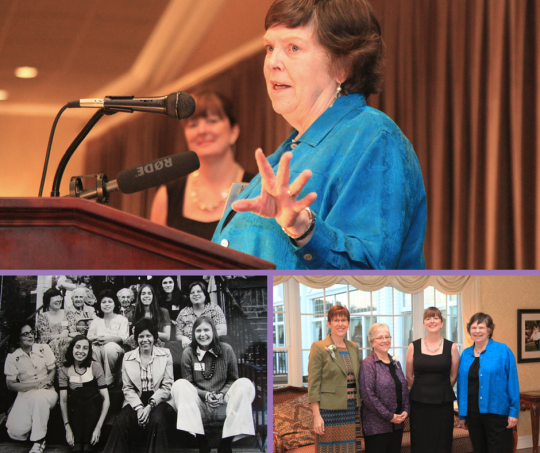 Pictures: Former Executive Director, Susan Meredith at CWEALF’S 2013 Annual Awards Dinner, CWEALF Summer Open House 1973, CWEALF former Executive Directors Anne Stanback, Leslie Gabel-Brett, current Executive Director Alice Pritchard, and Susan Meredith.